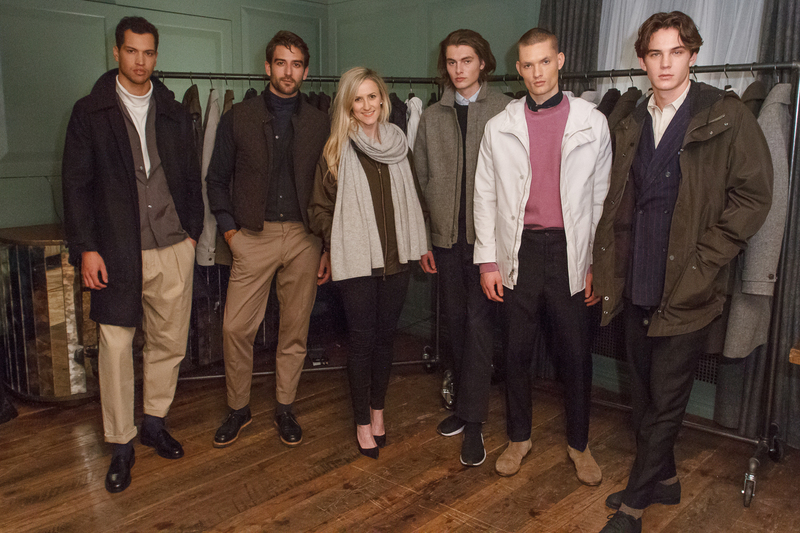 Last Tuesday, fashion designer Annie Campbell showcased her Exley Fall Winter 2017 menswear collection with a fashion presentation at the Soho House in New York City. 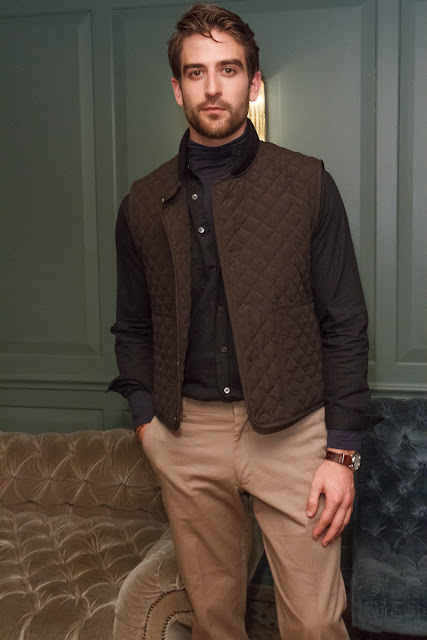 Five models posed and mingled in the label's outerwear pieces while guests snapped photos, wrote down notes, and admired the looks on the men and on racks. 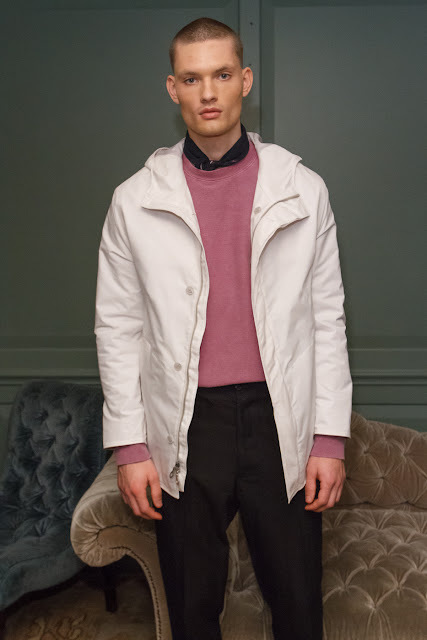 The jackets, vests and raincoats are very modern, wearable, cool and attractive. They also feature several technical innovations. The one and half year old brand is based in New Bedford, Massachusetts. Ms. Campbell, found inspiration for this season’s collection in the varying conditions of life in New England: “From the wet cement on city streets to the wonderland of snow banks of melting slush with the path tracks from people before you, this collection is a reflection of meaningful perceptions found throughout New England’s city and coast life.” A new ‘Quilted Vest Liner’ with wool knit collar and functional front patch pockets is introduced. It looks really versatile and is perfect for layering. collection by Annie Campbell, at The Soho House in New York City on March 7, 2017.
by Annie Campbell, at The Soho House in New York City on March 7, 2017. Also, "a majority of this season’s collection encompasses a certain level of water resistance, with the highest being made of fully waterproof fabrics with sealed seams, as featured in the ‘Lightweight Rain Jacket,’ ‘Raincoat,’ ‘Utility Parka,’ ‘Waterproof Topcoat,’ and ‘Waterproof Panel Jacket.’" Please click on link to view more images from the Exley NB Fall Winter 2017 fashion presentation. Last month, Couture Fashion Week celebrated its 25th season with a three day fashion show extravaganza. The event took place at The Crowne Plaza Times Square Manhattan from February 10th to the 12th. Fashion designer, producer and artist Andres Aquino presented another series of runway shows exhibiting couture gowns from around the world. Over 20 fashion designers from Vietnam, India, Australia and many more countries participated. 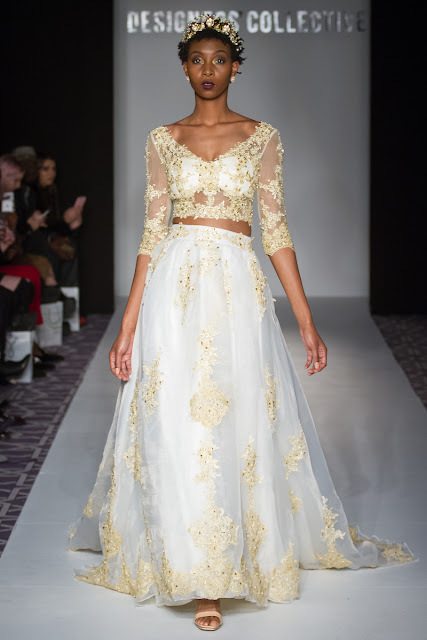 This article highlights three designers from the Friday February 10th shows. 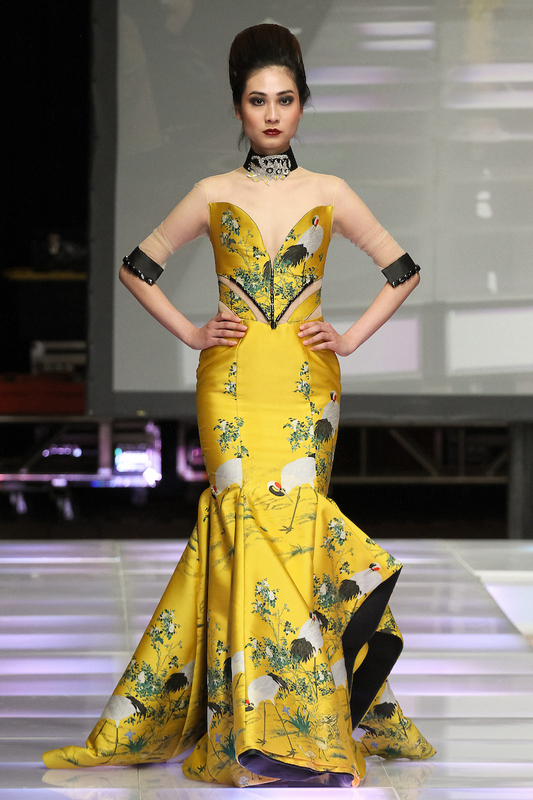 Cory Couture by Vietnamese designer Cory Tran presented 13 beautifully crafted outfits. Twelve looks were formal gowns and one look consisted of shorts, a crop top and short sleeve matching jacket. Black was the base color of most outfits, with lots of yellow and graphics of birds stitched and added in jaw-dropping detail. American designer Rose Sharifi unveiled her eponymous label's "An Exotic Bloom" collection. There were six very feminine gowns covered with flower details. Most look light in weight and give off a carefree, joyous feeling. The last show of the night was Cuero Design by Chilean fashion designer Paulina Cañas. Ms. Cañas showcased 12 contemporary womenswear outfits. She color coordinated garments makeup and accessories. For instance one model wore a red short skirt, red jacket, red lips, eye shadow and red earrings. Another model wore a sand colored skirt and top with blue jacket, blue lipstick, blue eye-shadow along with gold and blue earrings. The designer's use also of green, white, black & silver gives the impression she was very much influenced by nature and minerals. Click on link to view all collections from day one of Couture Fashion Week Fall 2017. Fashion Gallery New York Fashion Week held their FGNYFW Fall Winter Collections 2017 runway shows in New York City, from Friday February 10th to Sunday the 12th. The three-day series of fashion shows took place during New York Fashion Week: Women's Fall Winter 2017. There were a total of twenty-four collections presented with designers from Norway, Colombia, United States and many other countries. 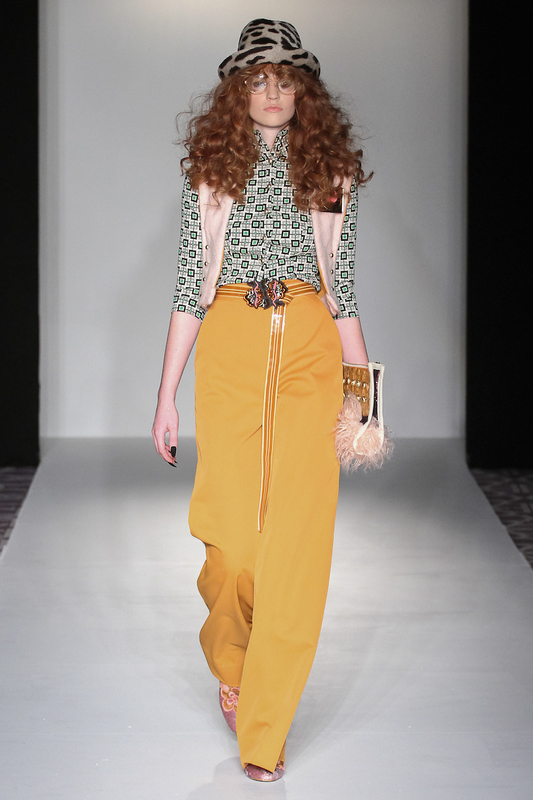 Five individual and six group shows provide a wide range of styles, looks and fashion options. The event was held at The Steward Hotel, located at 371 Seventh Avenue, also known as Fashion Avenue. Friday consisted of solo shows from Avid Swim by Gionna Nicole, Kepaza by Pernille Fristad and Layana Aguilar. The Avid Swim "Cadiz Resort" 2017 showcased 13 swimsuits. One of them were for men, and one was a Burkini. On Saturday, fashion students Maria Balestino and Ashlee Bowers from Philadelphia University participated in the Designers' Premier show. Naldo Montañez, Kita Griffin and Nicteel by Owana Lima also participated in the first group show. 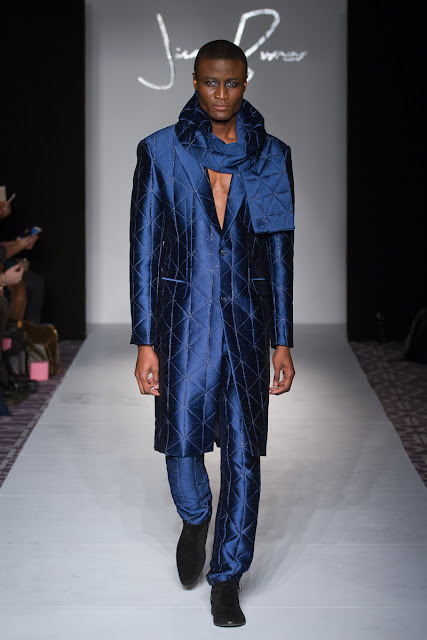 Later in the day, the very talented 18 year old Jimmy Burner from Houston, Texas unveiled his collection of twenty menswear and womenswear outfits. The Designers' Collective was held that evening showcasing lingerie by Taryn Winters; bridal gowns from Jeilyné Santana Haute Couture; and men's & women's street style clothes by Another Place. Included in this group was Flesh by Malin Molden and Black Rat by Siri Sveen Haaland. Both designers are based in Norway. Sunday afternoon began with the Emerging Designers fashion show, which was made up of Asian, African and Norwegian design influences. The collections on the runway were S'MM by Jihyun Kim, Keminevar by Raven Ledbetter, as well as garments from Line Skjervheim Gilhuus, Lisa Anker-Rasch Strom and Heggy Gonzalez. The last group show was Prêt-À-Porter. Brands showing their Fall Winter 2017 lines were Chapman McIntyre by James Chapman and Jacob McIntyre; Antidote by Christine Andresen and Antinoo Menswear by Lily Montes from Colombia. The final fashion show of the season was the Mondo Guerra Fall Winter 2017 "Late to the Opera" collection by the Project Runway winner.